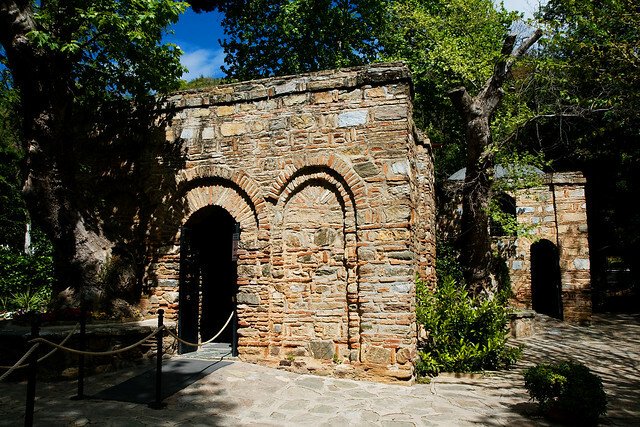 Ephesus, Grotto of the Seven Sleepers and the House of Virgin Mary are all within a 5-10 minute drive from each other. I didn't bother trekking up to see the Grotto of the Seven Sleepers as the kids were knocked out in the car. Lil Bro who made it up said the kids are too young to manage the uneven uphill hike anyway. It has an interesting legend which goes something like this. During the Roman times, approximately 250AD, seven young Christian men refused to denounce their faith and was eventually chased into a cave where the Roman Emperor, Decius sealed it shut. They soon fell asleep and woke up 150-200 years later and was astounded that centuries had passed. They died a shortly after and was buried in the cave. I knew practically nothing of the House of Virgin Mary which just goes to show how much reading of the guide books I'd done. We thought it would've been a sin to leave this last tourist attraction out without at least taking a peek. How they managed to find the ruins and restored it is indeed a miracle. A young nun Anna Katherina Emmerich (1774-1824) from Westphalia (west-central Germany) suffered greatly from stigmata. In one of her visions, she was able to describe in detail the persecution in Jerusalem and then the journey of Virgin Mary with Jesus' apostle, John to Ephesus. She recounted the exact location as well as an accurate impression of the actual house which St John had built for Virgin Mary. It wasn't until the late 19th century that H.Jung, a Lazarist priest was successful in locating the house. It was a rather surreal experience walking into the house even with what little knowledge I have of it. In fact, I would describe it was feeling rather emotional, comforted and loved. It wasn't much later than I found out it was a place of pilgrimage where even the popes had paid visits there. I'd also filled up my bottle with the water from the spring which I promptly tossed out as it tasted slightly metallic. This was a DUH (!!) moment because when I looked up the place when I was back at my hotel that this water apparently has healing properties. 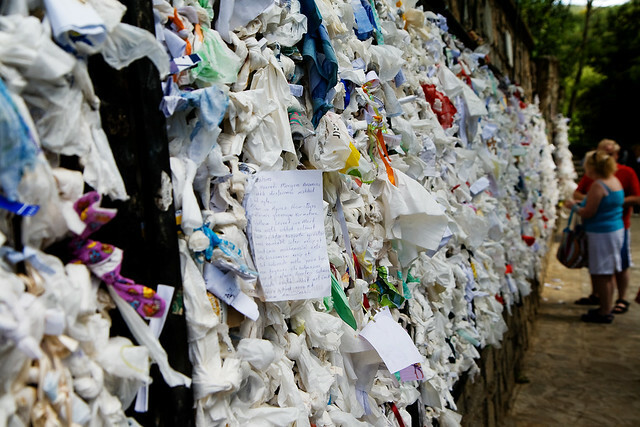 Messages were tied onto the cloth just outside the house.